It was my neighbor Carlotta Florio. Carlotta works for a major film studio in L.A., and although she lives in the Hollywood hills and uses her Connecticut house less than three months a year, she still considers it home. And when she’s here, our group of gastronauts hangs up our aprons because we know that before she’s pulled into her driveway she’s already shopped for a week’s worth of lush, candlelit dinners to which we are invariably invited. But a Bundt cake? Isn’t that the dominion of Betty Crocker and cake mixes with puddin’ packs included for extra moistness? Weren’t they part of the sorry-looking lineup at every bake sale we held to raise money for our high-school photography club? As far as I was concerned, Bundt pans were retired along with air poppers and avocado-green fondue pots sometime in the late ’70s. “Carlotta, I’d love to, but I don’t have a Bundt pan,” I said, getting myself off the hook rather elegantly, I thought. It’s not that I was weaned on haute pots. In fact, quite the opposite. My mother has cooked with the same ragtag collection of decidedly nondesigner pans for 45 years. My first pots were a 24-piece set that had me buzzing with excitement in the store until I opened the box at home and realized that every cover, strainer insert, and cheap plastic slotted spoon counted toward the Herculean number. Before I had time to think of an excuse, Carlotta was rapping at the back door. She plunked down the bag of groceries, and on top was the much-ridiculed pan. “Be careful with this,” she cautioned. “It’s expensive.” An expensive Bundt pan? Never was there a more precise dictionary definition of oxymoron. “Who’s coming to dinner?” I asked, hoping it was just the two of us. Flo Fink Fowkes. I’ve never met the woman, but the pronunciation of her name has caused me immense embarrassment on more than one occasion, especially after a few glasses of good Bordeaux. And the specter of her cake, which for two years has been used as an ego machete, cutting me down to size whenever I’ve bragged a bit too much about my baking skills, turns out to be a Bundt cake! Bring it on, I thought. Carlotta pulled out a grease-mottled sheet of paper. “Here’s the recipe,” she said. It was a copy of Ina Garten’s Chocolate Chunk Orange Cake from Barefoot Contessa Parties! (Clarkson Potter, 2001). I shook my head. Business must be bad if poor Ina, the doyenne of prepared foods for the Chanel set in East Hampton, has stooped to making Bundt cakes. Carlotta kissed me goodbye. “Don’t worry, it’ll be great,” she said. By now I was hardly concerned. A quick scan of the ingredients revealed nary a puddin’ pack. In fact, the recipe was formidable — for a Bundt. I hit a snag almost immediately, though, when I tried to grease and flour the pan. Every time I tilted it to coat the internal tube, flour spilled all over the counter. I tried flicking the pan with short, quick movements in an attempt to toss the flour in the air and catch it on the interior, but I got more on me than I did in the pan. Not to be outdone by a Bundt, I simply hurled handfuls of flour at it until the entire pan — and floor — was sufficiently covered. As I mixed the batter I noticed it was thick with plenty of butter and eggs and was studded with nearly a pound of chocolate chunks. An orange-sugar syrup was brushed on the baked cake, then chocolate ganache — a glossy mixture of melted chocolate and heavy cream — was poured on top. When the cake was finished it was surprisingly majestic. I delivered it on my best crystal cake stand to Carlotta and then collapsed, exhausted, onto my bed. That night my anxiety about mixing it up with Hollywood types evaporated the moment I walked into Carlotta’s home. For people who regularly rub elbows with Barbra, Julia, Dustin, Nicole (pre- and post-Tom), Jack, and Meryl, they were remarkably down-to-earth, even ordinary. At dinner Steven Flynn, Carlotta’s boss, and his partner, Tim, were recounting their battle with their contractor over some exotic mold that was chomping away at their house. Ellen, their onetime colleague, was enlightening us about her upcoming vacation to Cuba for salsa lessons. And Carlotta presided over it all, matching and mingling bits of conversation so no one was left out. Then came dessert. Carlotta and Ellen paraded into the room with my cake — and a gorgeous bakery-bought coconut cake that had mysteriously appeared, owing to Carlotta’s need to stuff her guests to bursting. “Flo’s cake!” said Tim, grabbing a fork. “It better be good, David.” Would Flo Fink Fowkes ever stop being my baking yardstick? I passed on the coconut cake and, to my deep satisfaction, watched everyone but Ellen do the same; she was trying to get into a Cuban mood. The cake was dense and rich, with a tingle of orange and the smooth melt of ganache. Carlotta looked over and smiled. That night I had passed two tests: the Flo Fink Fowkes challenge and, despite my deep-seated aversion to any pan with a hole in it, the Bundt-cake bias. Finally free of my partiality, I bought my first Bundt pan not too long ago. And, yes, I store it in the back of the cabinet, lest one of my gastronaut friends see it and scoff. But at least my once-virulent prejudice has been reduced to the lesser charge of mere mortification. Flouring a bundt pan is definitely one of the most frustrating experiences! Love your solution! I usually wrestle with it over the sink. Not exactly elegant, but it works. Su Su, you caught me! Yes, it’s a piece from our archives. As we continue to transfer files from the old site, we’re reviving some of our all-time favorite articles. And, not only has my prejudice mellowed, I have a recipe in my cookbook that actually calls for a Bundt pan. If that’s not progress, I don’t know what is. Laughed when you first posted this, laughing now. David, you are fabulous. My family is still talking about your cookies. LOL! You are just TOO funny. David, cracked my first deep belly laugh of the day, merci! Great article, David! Next time you break out that pan though, try using one of the cooking sprays that also contain flour. They’re perfect for Bundt pans. Why David, I’m surprised at you! 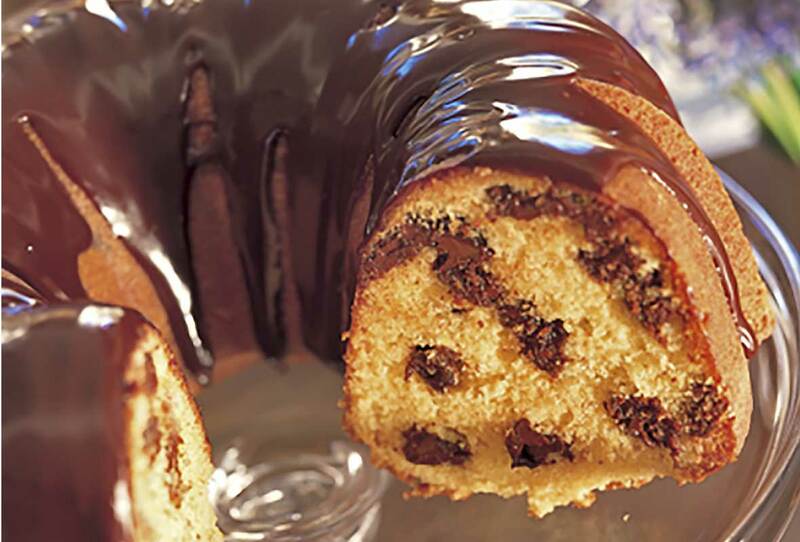 Bundt cakes are classic German/Austrian—otherwise known as Gugelhupf. : ) Luscious. Daughter is allergic to chocolate, so our specialty is a pumpkin version with a penuche glaze. Luscious. Guilty as charged. I now used a Bundt pan all the time. I have an orange and olive oil in my book, which I make frequently. So I went from not owning a Bundt pan to owning three. Your website is wonderfully diverse and entertaining. The recipes deliver consistently delicious results. Your Orange-Olive Oil Cake is second to NONE—and I have had many. The cake is also hot-weather proof; it sat in my 95+ degree kitchen over three days and aged like fine wine—luscious! Best wishes and much thanks! And thanks for the comments about my cake. I does get better with age—like all of us! Carlin, I do use baking spray with flour on my Bundt pans. In fact, I recommended it for my orange olive oil cake. I find it gets into the nooks and crannies better than butter and flour.